Swell Voyage » Plastic Swear Jar Challenge!! Make your jar for next week’s challenge! Each time you use single-use plastic counts as a ‘swear’, and you can decide however much to put in the jar each time! It’s almost Earth Day, and even though I try to live like it’s Earth Day everyday, there is always more to do! This year, I’m focusing on further reducing my dependence on SINGLE-USE PLASTICS. Almost all of us can do better at this! 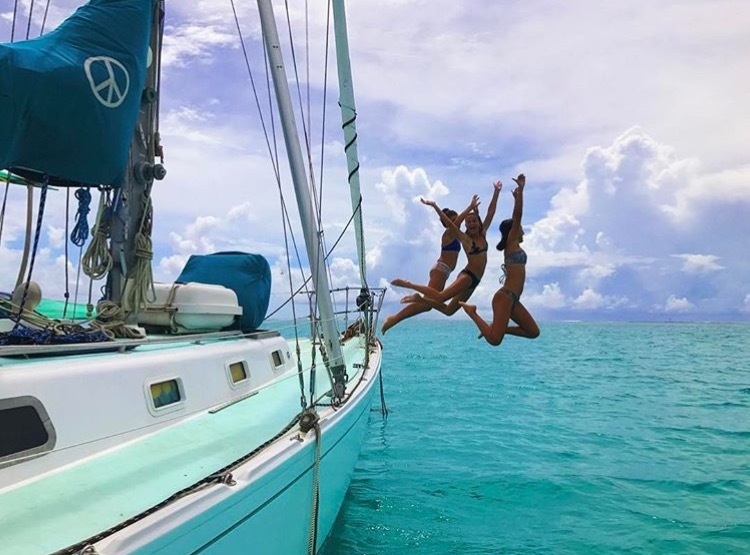 So next week, in honor of Earth Day, me and my sea sistas at Changing Tides Foundation are hosting a 7-day challenge to develop more awareness about our use of single-use plastics! It’s easy and it’s gonna be fun. Everyday, I collect trash from the oceans and beaches here in the South Pacific. At least 8m tonnes of plastics leak into the ocean every minute. Ugh! Enough plastic is thrown away each year to circle the earth four times. Annually approximately 500 billion plastic bags are used worldwide!? Plastic in the ocean breaks down into such small bits that pieces of plastic from a one liter bottle could end up on every mile of beach throughout the world!? These tiny pieces enter the food chain, harming wildlife–one million sea birds and 100,000 marine mammals are killed annually from plastic in our oceans–as well as contaminating fish that ends up on the plates of seafood consumers. Plastic chemicals can be absorbed by the body—93 percent of Americans age six or older test positive for BPA (a plastic chemical). Scientists predict that there will be more plastic than fish (by weight) in our oceans by 2050! So what can we do!? Well, according to the laws of supply and demand, we the consumers have the power to make a difference. We can refuse single-use plastics and bring our own reusable waterbottles, cutlery, cups, and shopping bags! We can say, “Ice tea, no straw please.” … when ordering drinks in restaurants. We can opt to buy items packaged in an alternative to plastic. THE OBJECTIVE: TO BRING AWARENESS TO THE AMOUNT OF SINGLE-USE PLASTICS PURCHASED AND USED IN OUR DAILY LIVES BY CREATING ACCOUNTABILITY. 4. LET US KNOW YOU’RE PARTICIPATING BY SHARING A PHOTO WITH YOUR CHALLENGE AND TAG @CHANGINGTIDESFOUNDATION & #PLASTICSWEARJAR FOR YOUR CHANCE TO BE FEATURED AND WIN SOME OF OUR ECO-FRIENDLY GOODIES. AT THE END OF THE 7 DAYS, YOU HAVE THE OPTION TO DONATE THE FUNDS TO CHANGING TIDES FOUNDATION VIA OUR #PLASTICSWEARJAR FUNDRAISER PAGE, WHICH WILL BE USED TO BENEFIT OUR ENVIRONMENTAL INITIATIVES. BE HONEST! THIS WON’T WORK UNLESS WE HOLD OURSELVES ACCOUNTABLE. REMEMBER, THIS ISN’T ABOUT BEING PERFECT, IT’S ABOUT BECOMING MORE AWARE. YOU ALSO HAVE OPTION TO PURCHASE A DISCOUNTED PRODUCT BUNDLE OR SHOP OUR INDIVIDUAL ECO-FRIENDLY ITEMS TO JUMPSTART YOUR SUCCESS ON THE #PLASTICSWEARJAR CHALLENGE AND 100% OF THE PROCEEDS OF YOUR PURCHASE WILL BENEFIT CHANGING TIDES FOUNDATION. FEEL FREE TO MAKE THE CHALLENGE YOUR OWN! WE ENCOURAGE YOU TO PICK A NUMBER OF DAYS FOR YOUR CHALLENGE (7 IS RECOMMENDED, BUT 3 IS GOOD, EVEN 1 DAY MAKES A DIFFERENCE). USE YOUR PHONE, A NOTE PAD OR IOU’S TO KEEP TRACK OF YOUR “SWEARS”. GET YOUR HOUSEHOLD (FAMILY/ROOMMATES/KIDS) TO PARTICIPATE. GET THIS GOING AT WORK AND INVITE YOUR OFFICE TO PARTICIPATE. TAKE NOTE OF HOW MANY “SWEARS” YOU MAKE PER DAY AND TRACK YOUR DAILY PROGRESS. 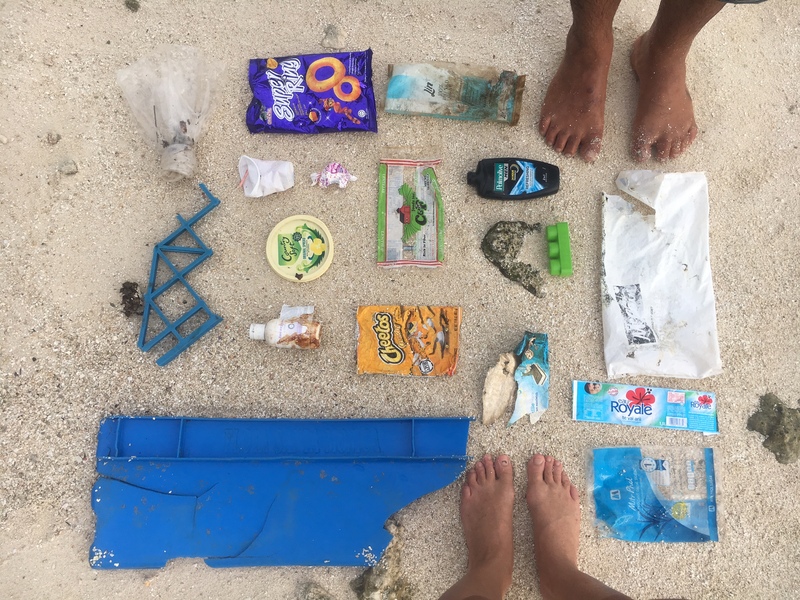 Tahui and I collected this on ONE trip across the lagoon! Not only does this plastic packaging pollute, most of this stuff isn’t good for our health to use or consume either! We all deserve a clean ocean to play in, thriving marine ecosystems to observe, and healthy seafood to eat! I understand what you’re saying and mostly agree. I think pressure on the producers of the products you’re talking about is an avenue to be considered. 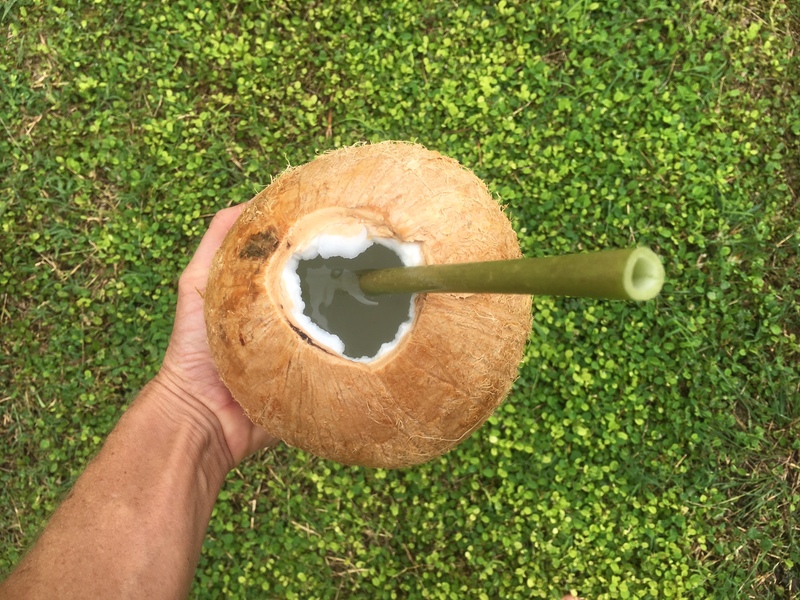 What is the alternative to plastic for liquids and small package products? Large parts of the world are populated by very poor people whose lives are enriched by affordable products packaged in plastic. It is my understanding that plastic is less expensive therefor more affordable for these folks. Educating the worlds population on how to dispose of their garbage is important. Not all the trash in the ocean comes from thousands of mile away, some of it is generated locally. Perhaps change starts there. I think that you probably make an impact on that level, right? I respect what you do and your obvious love for this world and it’s people. I send you light, good thoughts and a promise to consider your words and the change they call for. Replacement material, yes I agree. I wonder if the makers of plastic have considered that? May I say, I’ve been coming here for some time and am impressed with your genuineness. I sense that you are true and I respect your values. I also respect the strength you bring to your life. You are a beacon to strong young women everywhere. Hey! 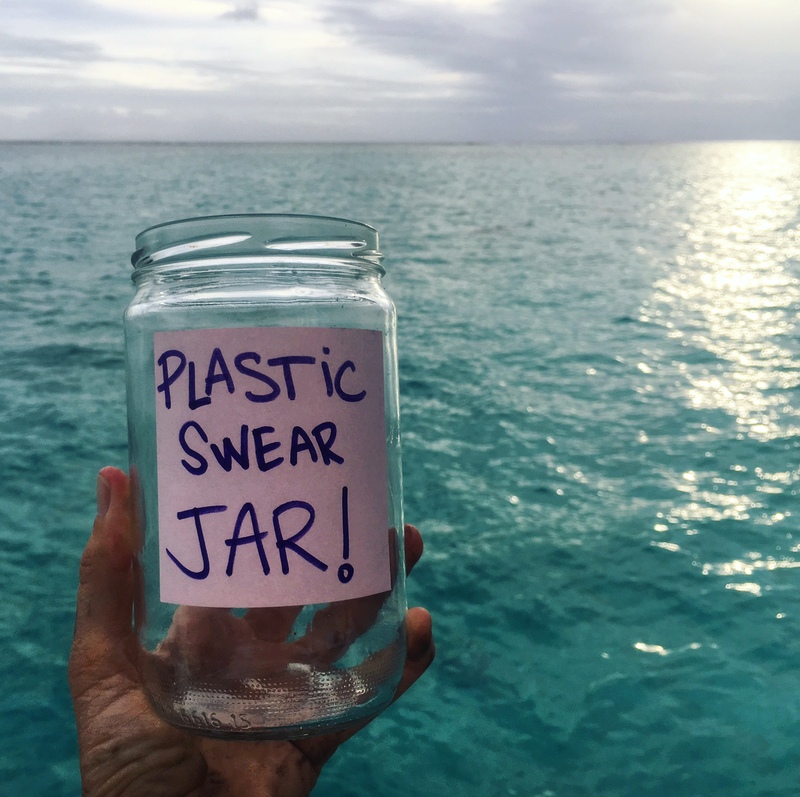 We had this amazing “original” idea to do a swear jar for “plastic free JULY” …and then when we were looking for images…we found yours!!!! Hope you don’t mind if we re-use your jar image to increase awareness about ‘plastic free July’.